Sports medicine specialists are an integral part of the treatment team at Tahoe Fracture & Orthopedic Medical Clinic’s Reno, Nevada, location. We also have a number of physical and occupational therapists, physician assistants, and nurse practitioners on staff who possess the knowledge and experience necessary to assist you with your treatment. Because we generally recommend that our patients first pursue a course of conservative treatment, you don’t need to worry about being pressured into undergoing any unnecessary procedures. 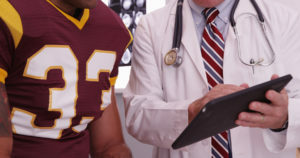 If your sports medicine treatment plan ultimately requires surgery, however, you can rest easy knowing that we have a number of orthopedic surgeons on our team who can assist you. If you require treatment for a sports-related injury or condition, look no further than the sports medicine specialists at Tahoe Fracture & Orthopedic Medical Clinic’s Reno, NV, office. Please call our centralized scheduling office at 775-783-6190 to set up an appointment. We look forward to helping you achieve your goals and maximize your performance throughout recovery and training.